Exact Editions will be making announcements in the next 10 days on exciting improvements in the way that magazine archives are searched and browsed. Before we get into the details of this new functionality, it may be useful to make some general points about searching digital magazine archives and the way ‘search’ is handled by the Exact Editions service. We will pitch examples from the Gramophone archive, but similar techniques apply to all the magazines using the platform. Gramophone is by some way the biggest magazine archive available in iTunes Newsstand, it provides access to 1097 issues published since 1923, and every single issue can be read by subscribers to the digital magazine service. For a magazine with as much deep content as Gramophone, search is an essential tool (if it were practical to sync every back issue, the archive would come in at over 50Gb, basically exhausting all the space on a high-end iPad). With so much content search is crucial. Clever searching helps to unpack the riches of this content trove. Here are some basic tips for iPad users. Users who want to narrow a search will find that they can do so by careful selection of key terms and then further focus by using search by century, by decade, by year, and of course by issue. The period can be selected from the drop down panel, that comes from the ‘Issues’ button at the top left of the iPad screen. The search box helpfully displays the ‘period’ that will be searched in faint grey lettering. Searching archives of generally reliable magazines is not at all like searching the web. Often with a Google search, the user is just interested in the top three hits, very rarely do users of Google look at the second page of hits. We cannot pretend that every hit in a magazine search is going to be golden, but there is much less dross in comparison to the typical web search. In the next few days Exact Editions will be rolling out new apps that will now support 200 hits from a search term. 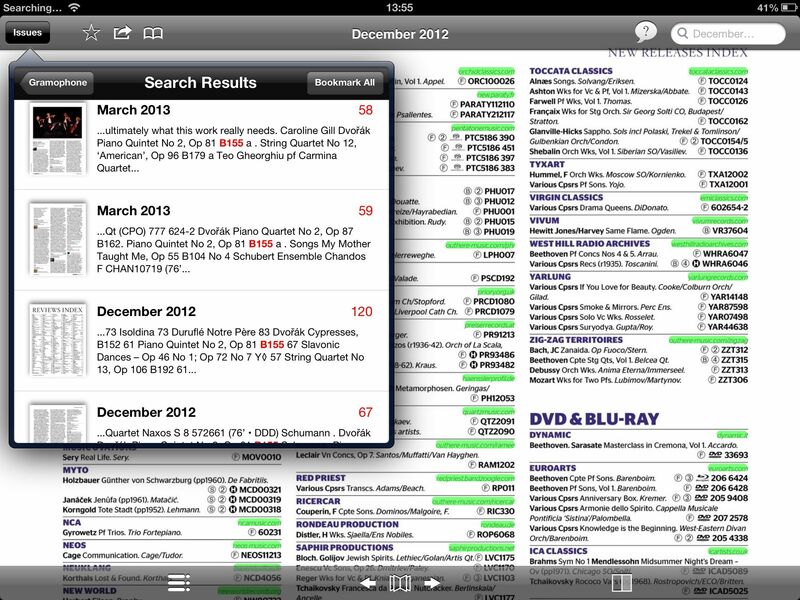 Furthermore any search result can be ‘Bookmarked’ which will result in all 200 pages in the results list being synced to the device; a strong feature for anyone with a serious research interest in classical music. Furthermore, ‘bookmarked’ searches remain available on the device for subsequent use. What is Netflix telling the Magazine Industry?